Because of the importance of the tourism industry within the U.S. economy there are many top-ranked schools offering degrees in this area of study. Every year thousands of international students come to the States to attend these schools and to acquire valuable internship experience. Thousands of international students choose to study tourism in the USA because of the importance of the tourism industry around the world. The USA is also home to a number of top ranked schools offering degrees in tourism. The criterion that makes these schools top level institutions can vary from the awards they receive, campus location, and the depth of knowledge and experience students gain from attending these schools. Many tourism degree programs are based in the business schools of universities and prove to be a very diverse field of study. To earn a degree in tourism, international students may find their courses centered around economics, marketing, geography, anthropology, biology, history, law, social sciences, architecture, and business – and most of the time it will also include internship experience. 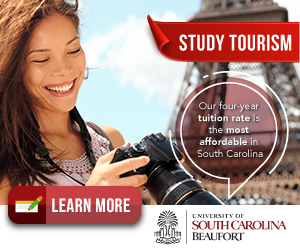 There is a long list of top schools offering a tourism degree in the USA. The School of Tourism and Hospitality Management at Temple University	was recently given the Haas Wilkerson Gold Pinnacle Award. The International Festivals and Events Association chose Temple's Event Leadership Executive Certificate Program as the winner of the award for its event management program out of 300 other higher education institutions worldwide. Aside from event management, Temple also offers a Bachelors of Science Degree in Tourism and Hospitality Management. Graduates of this degree are often sought after by companies to work as managers and event planners. International students must complete at least 124 credit hours to graduate from this program and must also participate in an internship. Many of Temple's students intern with important local, regional, state and national tourism organizations including Walt Disney World, Greater Philadelphia Tourism Marketing Corporation, Hyatt Hotels, and more. Some of the required courses for this undergraduate degree program include Tourism Planning and Development, Marketing in Tourism and Hospitality, Global Issues in Tourism and Hospitality Management, etc. Another good school at which to study tourism is Florida International University's	School of Hospitality and Tourism Management. This school is internationally recognized for its academic excellence and state-of-the-art instruction facilities. The campus is located in North Miami, Florida, which gives international students a chance to learn in one of the United States' top international travel and tourism destinations. FIU's School of Hospitality and Tourism Management offers both Bachelor's and Master's degrees in this area of study. The curriculum includes a mix of hands-on experience and academics; to graduate each student must complete the required academic courses, along with working a minimum of 1,000 hours in the industry, and complete an advanced internship of 300 hours. Some other top tourism schools in the States include: Brigham Young University (Hawaii, San Diego State University, University of Central Florida, University of North Carolina, and Oklahoma State University. To study tourism in the USA many international students will have to complete and pass certain tests in order to be admitted into these top tourism schools. The results of college placement tests such as the Scholastic Assessment Test (SAT)	or American College Test (ACT) are typically required in a college application. When students take the SAT, it is possible to select what college/university he or she would like the test results sent to. International students can also have their ACT scores sent to a specific school by contacting the American College Testing program. Usually the United States' embassies and U.S. Information Services offices will have information on testing dates and locations. An English language proficiency test is also usually required of international students whose native language is not English. Two examples of this test are the Test of English as a Foreign Language (TOEFL)	and the International English Language Testing System (IELTS). It is possible that an international student may be exempt or excused from taking the TEFL and IELTS if he or she has graduated from a high school in the United States. Also, a student may not have to take a language test if he or she has obtained a graduate or undergraduate degree within the U.S. or other English-speaking country. International students should contact the school they wish to attend to find out what tests and scores they need in order to be eligible for admission. In conclusion, thousands of international students choose to study tourism in the U.S. because of the many colleges and universities offering degrees in this area of study. Students are expected to learn about a variety of different topics that pertain to tourism, as well as gaining real-world experience through internships. Normally, international students will have to complete college placement tests as well as English language proficiency test to gain admittance to these top tourism schools.